Tetrahydrofolate (THF) is the combination of a pterin ring, p-aminobenzoate and glutamate (possibly multiple glutamate units. The initial product is folate, which has the second ring fully desaturated. This is reduced by dihydrofolate reductase by two moles of NADPH, first to dihydrofolate, and finally to tetrahydrofolate, THF. 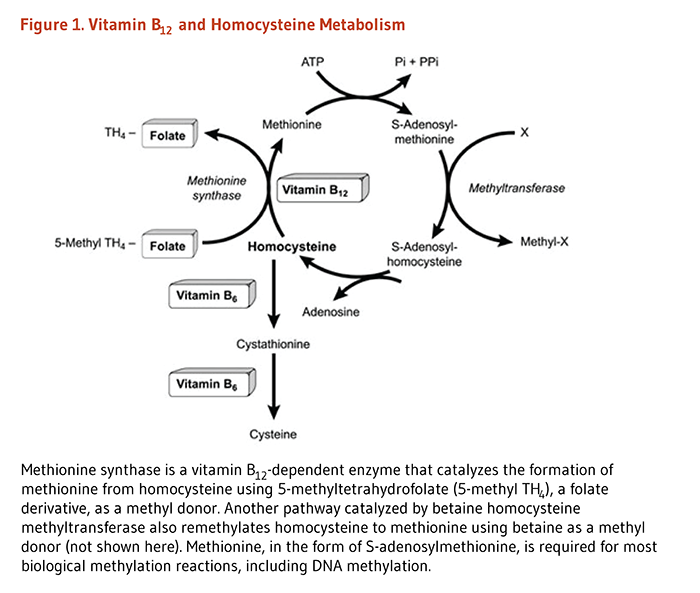 The balance between the use of methylene-H4 folate for DNA synthesis rather than for methionine synthesis might depend on the presence of the 677T variant of methylenetetrahydrofolate reductase (MTHFR) and the nutritional folate status. 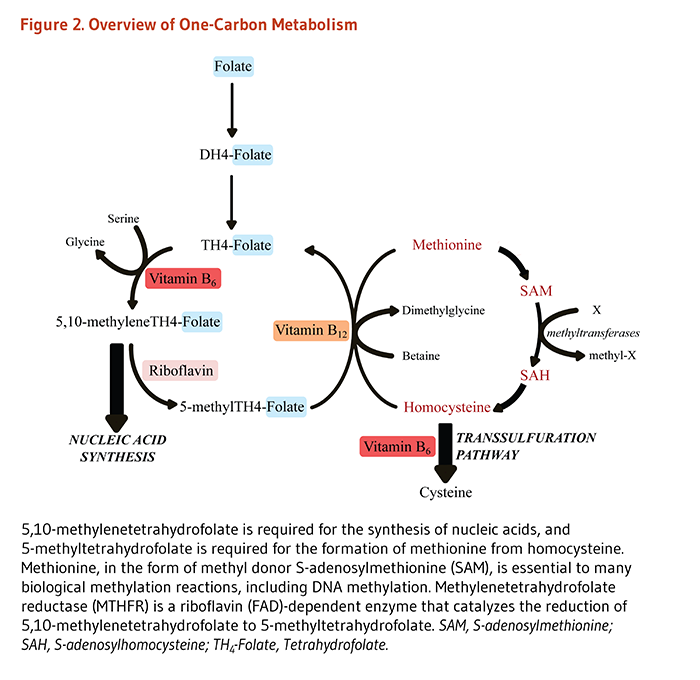 Given adequate dietary folate, the 677T variant of MTHFR functions as a 'valve', preferentially routing one-carbon units to DNA at the expense of methionine. If folate nutritional status is poor, the 677T variant might promote the misincorporation of uracil into DNA, leading to chromosome breakage. 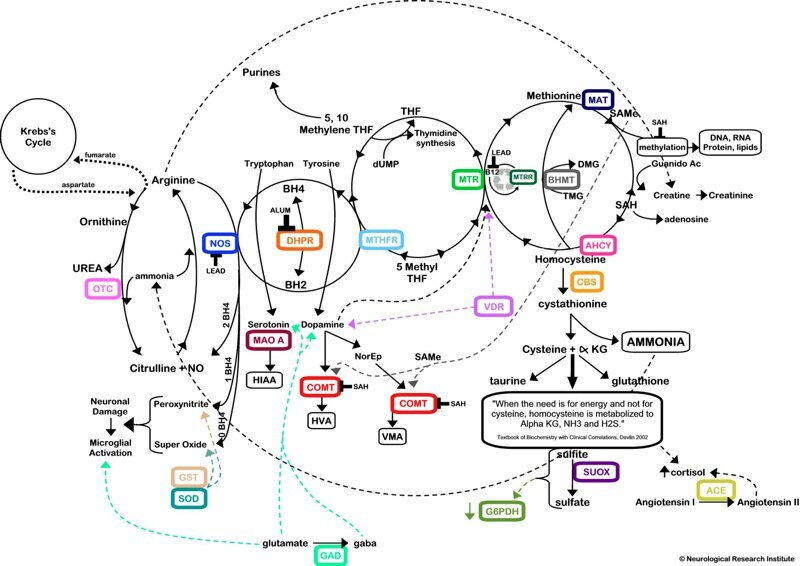 This mechanism might therefore select embryos that are best suited to reproductive success for a given environmental abundance of dietary folate by augmenting dTMP (deoxythymidine monophosphate) synthesis. Therefore, given the current practice of increasing dietary folate before conception, in utero selection of the 677T variant might lead to a negative, long-term effect on the prevalence of cancer and vascular disease for which this mutation is a potential risk factor. BH4 is a basic cofactor involved in norephinefrine and serotonine synthesis. Deficit of norephinefrine and serotonine play a major role in pathogenesis of Major Depressive Disease that is a leading cause of disability worldwide. Nowadays therapies of MDD are based on administration of SSRI and SNRI. 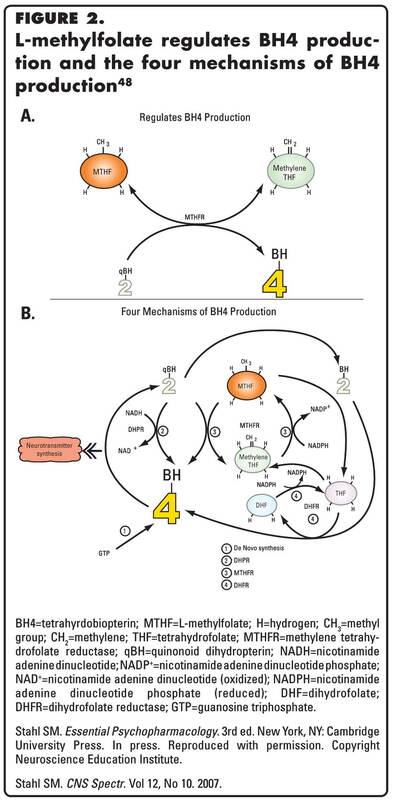 We decided to investigate the biosynthetic pathway of BH4. (as shown in the first picture). So could be really interesting evaluate if folic acid therapy could be useful in treatment of MDD patient. Nowadays no trials have been able to show that the supplementation of folate benefits depressive symptoms. There is an new Australian trials (2010 january) that will pursuit this target!!!! !